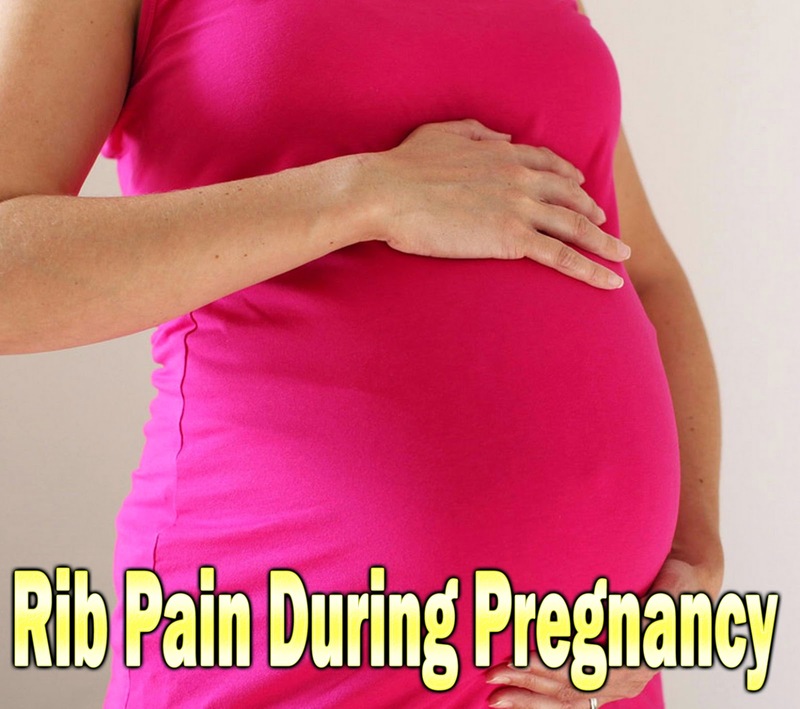 Rib pain during pregnancy can be a persistent problem, especially during the third trimester. Your rib cage may feel mildly sore or extremely tender and bruised. You may have discomfort on either side, or both sides, though it is commonly worse on the right side of the ribs. Pain occurs in and under the ribs as your uterus grows. Later in pregnancy, your abdomen becomes stretched, and your uterus stretches upward as well as outward. Your pelvis and abdomen are becoming full, and your baby is beginning to press up under your ribs and chest. This upward pressure from your baby may also make you feel short of breath. This pressure on your ribs and diaphragm may also result in shoulder pain, because there are nerves in the diaphragm which can refer pain into the shoulders. This pain can be very sharp! It may also result in indigestion or acid reflux as your baby puts the squeeze on your stomach. Additionally, as your breast become larger, they also place pressure on your ribs. During pregnancy, your breasts may increase by one full cup size or more. The extra weight pulls your shoulders forward and down, and places strain on the upper back, neck, and often results in pain around the rib cage. As your body prepares for the delivery of your baby, your hormones are hard at work loosening your muscles and ligaments. This loosening can allow your ribs to shift and move in ways that were not natural before, causing discomfort. Your ribcage is not only loosening, but expanding as well, not only to make room for your baby, but also to help increase your breathing and lung capacity. Even though you may be feeling short of breath, your body is taking in about forty percent more air than it did before you became pregnant. Try to wear loose clothing so that you do not add any extra pressure to your belly. Try getting a new bra. It is especially important to have a supportive bra that is not too tight. Under wire bras may put too much extra pressure on your ribs. Now may be a good time to invest in a good nursing bra. They usually offer nice support without being too tight and will be useful once your baby is born. Holding your arms up over your head can take some pressure off and provide temporary relief from rib pain by lifting the ribs away from the uterus. Practicing doorway chest stretches can also be helpful because they, too, will help rotate the shoulders up and back, which can also help lift the ribs away from the uterus. Stretching and prenatal yoga are great for keeping your body long and loose. The less compressed you are, the less your rib cage will hurt. Breathing and relaxation exercises may also be effective. There are a variety of hands on techniques that can help to gently stretch and lift your ribs away from the uterus. Applying these techniques to your breasts, chest and abdomen, can really relieve a lot of pain and pressure from your body, though you will need a friend or partner to help you. Scheduling a visit to your massage therapist, chiropractor, or acupuncturist, may also help provide relief from rib pain during pregnancy.